Hey Yall! I have been asked this so many times about what products I use in my hair to achieve all my popping curls. 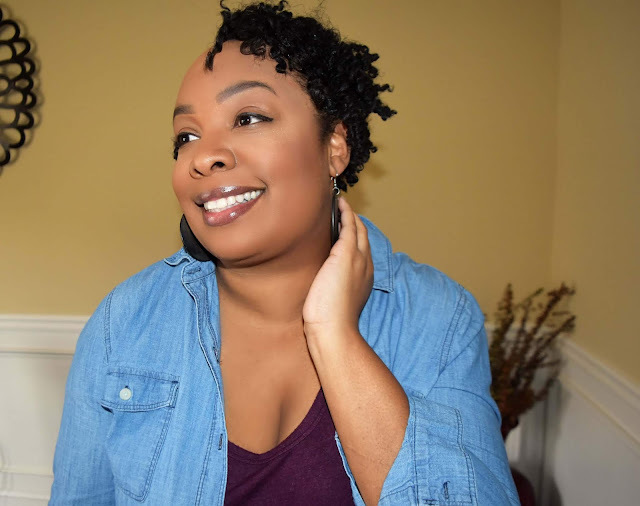 So, I decided I would do an update about my current hair styling routine for my short naturally curly hair. I'm happy that people like how my hair looks since it seems the whole wearing hair naturally is no longer the trend now. Women are more into wearing protective hairstyles like wigs and weaves. I remember the days it was taboo to be wearing wigs; it resembled that you were too lazy to take care of your hair, or you had no hair at all. 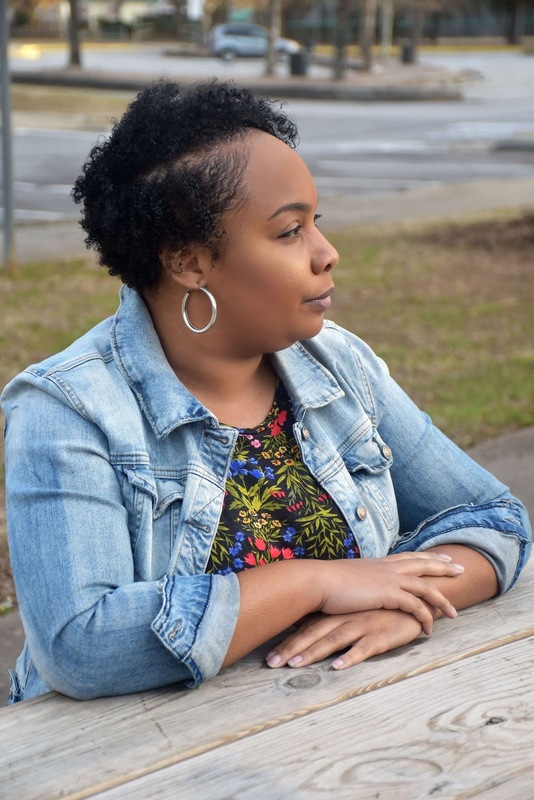 My hair has been natural for almost ten years now, I can't believe it, and I have no desire to go back to using those chemically filled relaxers when I can still achieve straight hair whenever I desire using a blow dryer and flat iron. I would have much longer hair right now if only I would lay off the scissors. It's hard for me to get past the awkward stage of my natural hair journey trying to grow out of its short hairstyles, so I would have my stylist to cut it in an A-symmetrical bob with my hair in the back short almost to my scalp. But, last year, I took on a new hair routine to keep the scissors away. 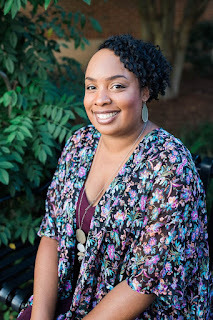 Doing wash-and-go has been the easiest hairstyle to achieve for me, and so much faster to get my hair styled instead of the twist outs I always use to do. Whenever I need to do my hair, I would jump in the shower, wash and condition my hair, then use styling products to get my hair curly and let it air dry. 1. Takes longer for my hair to dry, so it's not wise to do wash-and-go's during the cold winter months. This means I have to return to doing twist-outs. 2. My hair shrinks up so much that my hair looks like a fro. It makes it look like my hair hasn't grown at all making me grow impatient with my hair. 3. Although doing wash-and-go's is so much easier for me, I feel the hairstyle ages me a bit. I hate looking older than I am. The curly afro puff looks with no shape gives off an older 70's vibe that I'm not diggin'. But if washing my hair every day and styling it helps me to lay off the scissors, so be it. 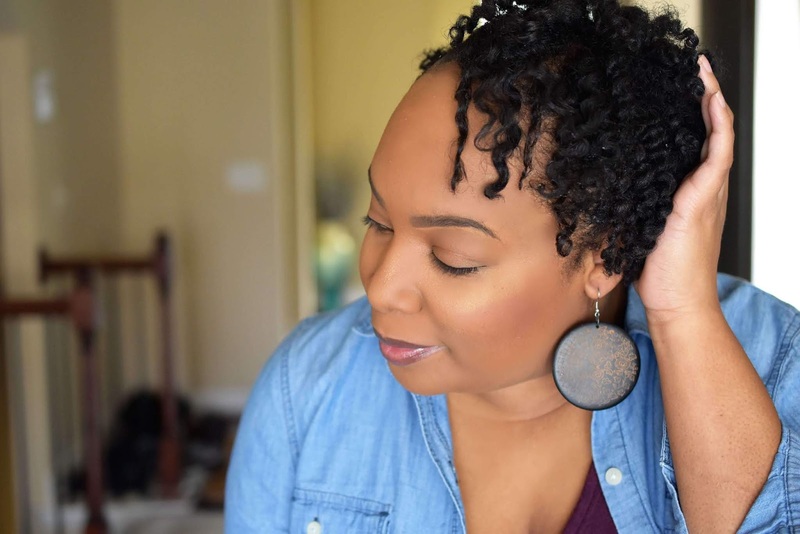 Check out the products I use to achieve my wash-and-go's and my twist-out hairstyles. Did you know that Garnier Fructis came out with new leave-in stylers? They are similar to Shea Moisture's cream stylers but better! I have been using Garnier Fructis brand longer than I can remember starting with their leave-in conditioner. The leave-in conditioner is essential to my hair styling routine because it is needed to keep my hair moisturized since I do use gel to get my curls more define with a good hold without the frizz and crunch. 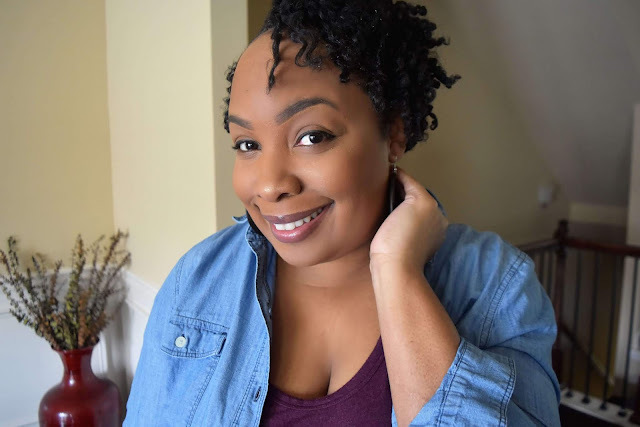 Now, since Garnier Fructis has two new leave-in stylers, Curl Treat Smoothie and Curl Treat Butter, I use those in place of the leave-in conditioner for both wash-and-go's and twist-outs. My hair tends to get very dry, primarily since I use gels, so having creamy thick leave-in stylers is vital to keep my hair hydrated and soft. Garnier Fructis Style Curl Treat Smoothie (Defining)- This styler gives hair a soft, bouncy definition all over, and controls frizz for up to 24 hours. With the curl treat smoothie being infused with avocado oil, it works on fine to normal hair, with moderate waves. Garnier Fructis Style Curl Treat Butter (Hydrating)- This hydrating curl butter drenches hair in moisture without the greasiness or weighing hair down, and fights frizz for up to 24 hours. The curl butter is infused with shea butter, and works on normal to coarse hair, with a spiral wave. Remember I said I also use gels for my hair too? Using a gel is the last step in my styling process. When it comes to gels that I use, I haven't found one that is my go-to yet. I'm still experimenting since my old go-to gel, Eco-Styler has been spotted having dangerous chemicals in it. Also, I noticed after each use of Eco Styler Gel; I would have terrible headaches too. I thought something was wrong with me, maybe due to having a lot of stress, but no, I discovered that Eco Styler was giving me those awful, pounding headaches. So far, I have been using cheap gels I find at either Walmart or Target because I hate to buy a product and end up hating it, wasting my money. As of right now, I have been using La Bella and Wet Line Xtreme Professional Styling Gel. Both gels are decent; however, if I don't use a moisturizing leave-in styler or leave-in conditioner, it makes my hair super hard and crunchy. I would love to know what gels you like to use that works best for you? I forgot to mention, shampoos and conditioners I like to use. I'm a bit of a shampoo and conditioner junkie when it comes to what I like to use. It always depends on my mood, and what hair issue I would like to combat. There are many others I like to use as well, but can't think of them off the top of my head. So, there you have it! The products I like to use to achieve my wash-and-go's and my twist-outs. This will be the year I will grow my hair out (knocks on wood). Yall need to hold me accountable. I hope I can keep the scissors locked up in my bathroom drawer and only use them for when my hair needs a trim. Please wish me luck! Disclosure: I was provided the new Garnier Fructis Leave-In Stylers free, all opinions are my own. Post contains Amazon affiliate links. What hair styling products do you like to use? Cute! I wish my twist outs looked as good as yours. I have to do wash and gos all the time, even in the winter. I've never tried these products but I'll look into them. You got to keep trying Sis. The first few times your twist outs won't look too good, but once you get the hang of it and the right products your twist outs will look so good! It's like you're going to have to train your hair to achieve those curly twist out styles. Daily hair washing, girl power to you. These days I'm still hanging in with the natural vibe. However, once every two weeks I'll wash and take the time to condition and flat iron it. When summer rolls around I'll be back to weekly washes or more if water activities happen and not looking forward to that. I haven't used any of Garnier's products recently, however, I believe I have used them a few times in the past. Lately, I've been exclusively using Carol's Daughters products to keep my hair from drying out with the exception of good old Sulfur 8 lol. Washing my hair daily was a chore at first, but I got use to it and I feel my hair thrive more with more moisture from water. I used Carol's Daughter's products in the past but it just sat in my hair and didn't do much to it. However, I bet their products are better now. I haven't used Sulfur 8, but I have heard of it.